The industry's first single-chip, x16 low-profile HBA, the 9405W-16e, is ideal for high-performing, bandwidth-intense applications. 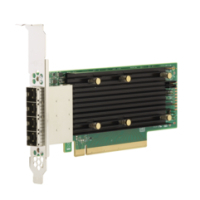 The 9405W-16e enables external communication to PCIe JBOFs with the same management utilities customers are familiar with when connecting to SAS JBODs. With the high sequential throughput, the 9405W-16e adapter delivers the performance and scalability needed by critical applications such as video streaming, medical imaging and big data analytics. *NVMe Support planned for SAS 3.5 P5 release.